CBM (Confederation of British Metalforming) has developed a series of 14 one-day training modules, using specialist technical people from within the industry, covering various hot forging and ancillary processes. The modules are aimed at those working in the forging industry and/or who require awareness as part of a metallurgy involvement. They will be delivered by highly knowledgeable and experienced people from within the forging industry. These courses are aimed at upskilling, apprentice ‘bolt on’ training, management awareness and knowledge enhancement. The content of the first six modules are now ready to be delivered and is detailed below. Hot forging is a complex process which results in a component with the desired shape and mechanical properties to meet specified service requirements. It is a thermomechanical process which relies on a fundamental understanding of metals and metallurgy. This module provides an overview of the structure and forgeability of metals, key characteristics in the design of a successful hot forging operation. Prior to the introduction of computer-aided design, (CAD), 3D solid modelling and simulation software, forging design was performed manually according to long established design principles. For someone new to the forging industry, it is essential to understand these principles before adopting the latest design tools, which are the subject of a later training module. Inevitably, the designer would have considered the equipment he had available to make the forging, the material, the application of the part and the process economy, but, for training purposes, the current module begins where the forging design module left off. The next step, therefore, is to design the finisher die and verify the filling of the die cavity, the die stresses and forging load. But, first, the designer must select the forging equipment that will be used. Forging simulation module is delivered by Dr. Nikolay Biba (Micas Simulations Limited, QForm Group). This module will enable the learner to have an understanding of practical implementation of simulation for improving of forging technology. Be able to find the ways to eliminate typical forging defects and reduce material waste. Thermal conditions of hot forging process and their role in simulation. Dies deformation and its influence on the forging process simulation. Non-coupled and coupled simulation. General aims and goals of modelling of forging process. Specifics of finite element simulation using commercial software tools to model bulk metal forming processes. 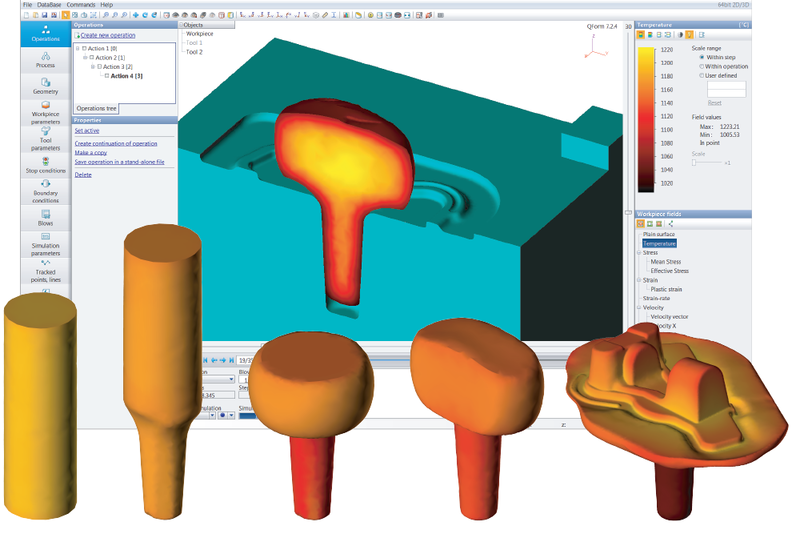 Material, equipment and lubricant data required for forging simulation. Basic routine to simulate forging process. This module will cover the history of dies and tool making for hot forging processes. The manufacture of hot forming tools. The tool steels used for hot forging and machining processes used for the manufacture of hot forging tools. Heat treatment of hot forging tools and surface treatment of tools and health and safety involved when handling and making tools. This module will cover die failure, friction during forging, lubrication in forging and graphite in hot forging. It will enable learners to have a better understanding of how to identify die failure and different causes of die failure. It will allow learners to have a better understanding of lubrication processes, be better informed about graphite products and the testing and variation of die lubes, the application and control of die lubes, spraying technology, coating formation and die lube maintenance. louise.campbell@thecbm.co.uk or call on 0121 601 6350.